“You see the impact it has on the cystic fibrosis community. It’s great to see our teammates rally around us and do it for a great cause. These kids struggle with an uncommon disease. It’s nice to bring a smile to their faces. It always touches my heart when we get to interact with them. The cool thing is you see a big impact being made in the treatment. It’s unbelievable that they have already made that much progress.”- Cam, on hosting the 65 Roses Sports Auction with the Cystic Fibrosis Foundation. Cam and Brett Keisel with their tough guy buddy. Anthony. 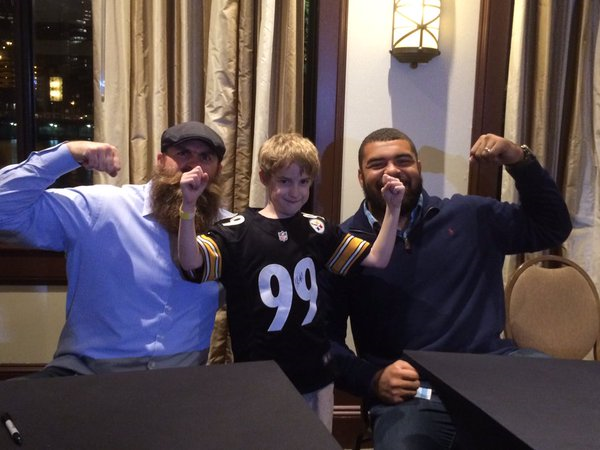 For some, it was simply a night to meet Steelers players, say hello and get their autographs. But for those who have battled cystic fibrosis throughout their young lives, it was a chance to connect with the players who were there to help them fight their battle and to leave with cherished memories that will last a lifetime. Steelers defensive end Cam Heyward hosted the annual 65 Roses Sports Auction to benefit the Western Pennsylvania Chapter of Cystic Fibrosis, and brought many of his teammates along with him to sign autographs for those in attendance. The best part for Heyward, and those touched by the disease, was the chance to interact with the kids and give them the uplifting support they need. “I have seen that dynamic,” said Pat Joseph, executive director of the Western Pennsylvania Chapter of Cystic Fibrosis. “A lot of times we get leadership, but it’s always a special thing to see someone like Cam who blends in and enjoys interfacing with some of our younger cystic fibrosis community. The kids who are overjoyed to spend time with Cam, and he with the kids. To see him understand and enjoy that role is truly amazing. This is the first year Heyward has hosted the event on his own, last year teaming up with former teammate and long-time host Brett Keisel. Heyward, who has attended every year, has embraced being a part of it. 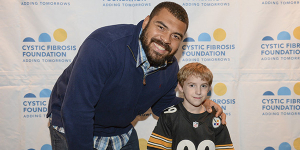 “You see the impact it has on the cystic fibrosis community,” said Heyward. “It’s great to see our teammates rally around us and do it for a great cause. These kids struggle with an uncommon disease. It’s nice to bring a smile to their faces. It always touches my heart when we get to interact with them. And that progress is aided by events like 65 Roses. View many more photos HERE. Thanks to all of Cam’s teammates who came out to support him at the event on Giving Tuesday!